Copper salts have found place in many industries from pharmaceuticals to agriculture, but they are rarely seen in petrochemistry and petroleum extraction. 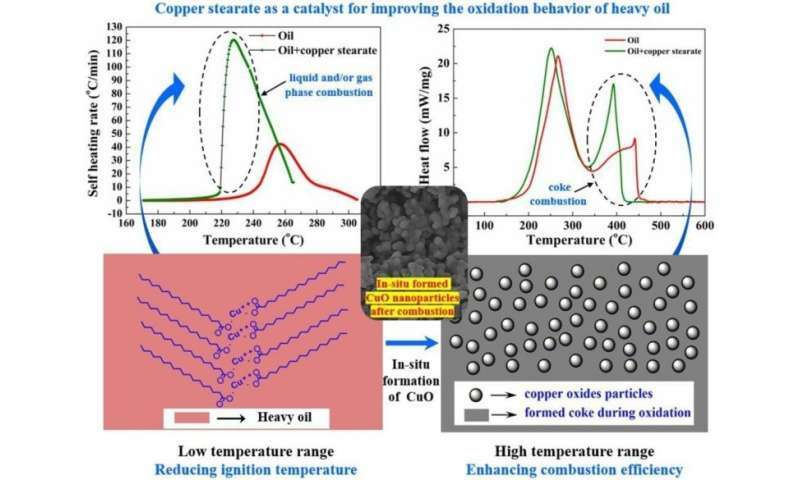 Now, Kazan Federal University scientists have showed that copper stearate can be a great catalyst for in-situ combustion and even improve oil quality under certain conditions. As the authors explain, most of the existing oil oxidation catalysts are synthesized from transition metals. But their one setback is that they are not soluble in oil and therefore not distributed in its volume. They are not useful as catalysts in that case, so the researchers were looking for other compounds with high solubility, and tried copper stearate. Its effectiveness was tested through high-pressure differential scanning calorimetry (HP-DSC) and adiabatic reaction calorimetry (ARC). The results were then compared to previously studied nickel stearate, iron stearate, and copper oxide. Copper stearate showed good results – it enhances oxidation, reduces activation energy, induction time, and combustion temperature, and increases coke burning efficiency. Its activity spectrum was also studied. Lab head Mikhail Varfolomeev says, "In-situ combustion comprises three stages: low-temperature burning, cracking and pyrolysis, and high-temperature burning. As the tests have shown, copper oxide only works during the latter two stages, and is thus a heterogeneous catalyst which requires high temperatures to be activated. Conversely, copper stearate proved to be an excellent low-temperature homogeneous catalyst." Thus, copper stearate demonstrated its capacity to be a trigger for in-situ combustion. It also is cheap and easily accessible, so, coupled with its catalytic effect, it could become one of the best options for in-situ combustion and underground refining.